Predictions for the care sector in 2016 – where next for care? What with the care sector in 2016 look like? There are more than 430,000 residents living in care homes across the UK and the sector employs over 1.4 million people…yet, many care home operators are facing an uncertain and challenging future. Four months ago, in our Summer 2015 newsletter, we published an article looking at what the next 12 months held for care sector. In summary, our outlook was tentative, predicting that the care sector would become a gradually more competitive and uncertain market with increasing compliance and financial scrutiny. That prediction was made previous to the introduction of the National Living Wage, which, from April 2016, will see operating costs for nearly all care homes across the UK rise significantly. 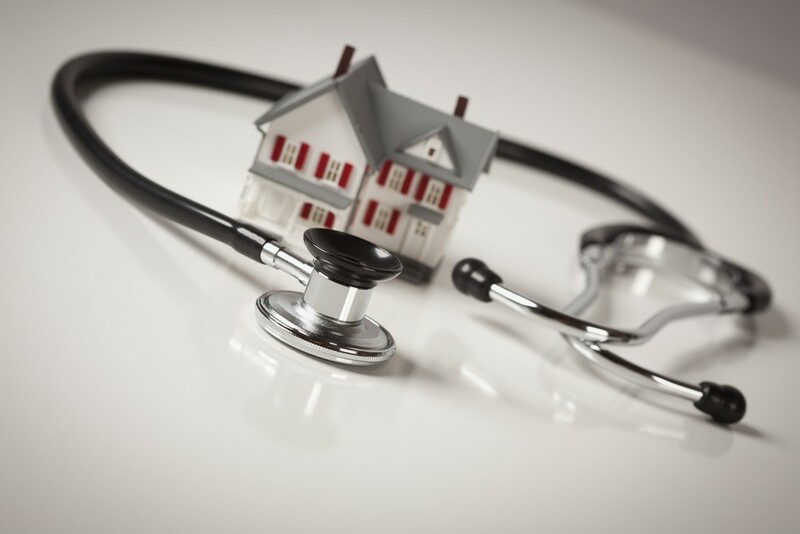 Now, we bring you our predictions for the care sector in 2016. 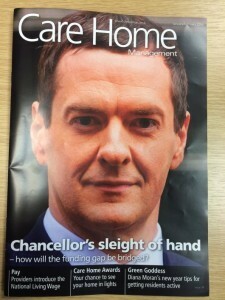 This article was recently featured in the latest edition of the Care Home Management magazine (see below). The question of whether or not care homes should embrace technology – be that iPads, surveillance cameras or anything else – is certainly a topical one. In a recent article we looked at care homes’ websites and now, in this article, we have looked at the broad use of technology in the care sector. As the pace of technology quickens and the need for operational and financial efficiencies continues to grow, the increased use of technology in care homes is inevitable in 2016. To what extent and for what means, however, remains to be seen. The last 12 months have seen the care sector face intense financial scrutiny, with significant regulatory changes. This mounting regulatory compliance in conjunction with rising costs (National Minimum Wage; National Living Wage; auto enrolment; energy prices) will likely result in many care owners looking to exit the market in 2016. Additionally, as some care homes are struggling to stay financially viable (between October 2014 and March 2015 the number of care home places in the UK actually fell for the first time) many owners may have to merge with another care group in order to ensure its financial sustainability. We expect to see a number of consolidations over the next 12 months. 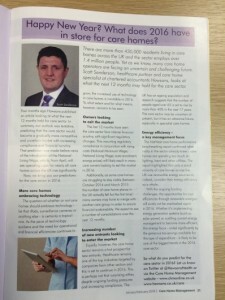 Equally, however, the care home sector remains a hot prospect for new entrants. Healthcare remains one of the top industries targeted by companies from other sectors and this is set to continue in 2016. This is perhaps not that surprising either, despite ongoing funding pressures and increasing compliance. The UK has an ageing population and research suggests that the number of people aged over 65 set to rise by more than 40% in the next 17 years. The care sector may be uncertain at present, but it has an attractive future, especially in specialist care homes. The NatWest care home performance benchmarking report confirmed what many in the sector already knew: care homes are spending too much on lighting, heat and other utilities. The report highlighted that only a small minority of care homes across the UK use renewable energy sources or, indeed, consider their energy efficiency as a whole. With the ongoing funding challenges that have been so comprehensively covered, the opportunities for cost efficiencies through renewable energies will surely not be overlooked again in 2016. Whether it’s implementing energy generation systems (such as solar power) or auditing current energy management to become more efficient, this energy focus – aided significantly by the generous tax-savings available for this type of expenditure – is likely to be one of the biggest trends in the 2016 care sector.